Valentine’s Day is less than two weeks away, and there’s no beauty product in my collection more fitting for a holiday that exalts romantic love than the Soul Kiss box of powder samples. When I spotted this in an online auction six years ago, it was as if I had been struck in the heart by one of Cupid’s arrows. The name alone implies intimacy, and I was instantly smitten by the packaging: the image of a woman raising herself up to submit to the caress of the little cherub, suggesting as it does that anyone applying the contents could ignite passion and become an irresistible object of desire. This unique design has made Soul Kiss products highly prized among collectors. The Soul Kiss line was popular in the early 1900s, when the Gibson Girl, created by illustrator Charles Dana Gibson, reigned as the paragon of American femininity. 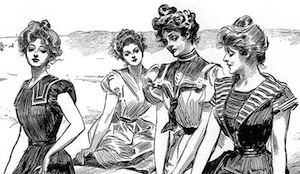 Although she was undeniably gorgeous, the allure of the Gibson Girl went much deeper than her physical attributes—it was her confidence and independent spirit that captured the imaginations of the women who sought to emulate her. But come the Roaring Twenties, women’s fashion had changed dramatically. The Gibson Girls’ towering piles of curls and cinched waists gave way to the bobbed hair and boyish silhouettes of the flappers. The Gibson ideal may seem antiquated now, a vestige of traditional femininity, but she has something in common with the modern Los Angeles woman: Both are reflections of their era. Standards of beauty may have changed during the decades since the genteel Soul Kiss model was considered supremely aspirational, but a woman of intelligence, compassion, and wit never goes out of style.